Ensure your food stays at optimal serving temperatures with the Carlisle Cateraide PC300N08 portable food pan carrier designed for professional caterers. 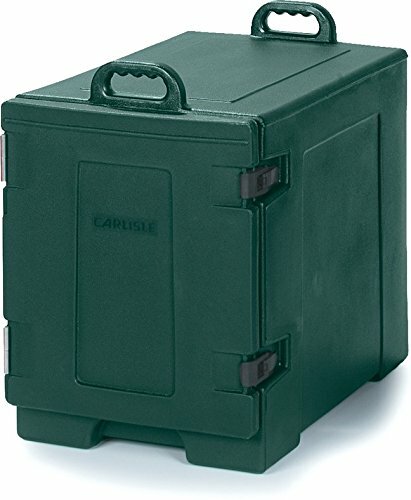 Made from rugged polyethylene plastic in an unobtrusive forest green color, the Cateraide is insulated to keep food hot or cold for 4 to 6 hours. Measuring 25 x 24 x 17 inches (H x W x D), the Cateraide PC300N08 fits easily into catering vans and kitchens. The high-strength plastic construction ensures long-lasting durability even with frequent transport. The Cateraide is designed to make your job easier featuring a unique end-load design and individual tracks for each pan allowing for flexible configurations. The food pan carrier can accommodate one of the following pan configurations: five 2 1/2" deep pans. Three 4" deep pans and one 2 1/2"deep pan. Two 6" deep pans and one 2 1/2" deep pan. one 6" deep pan, one 4" deep pan and two 2 1/2" deep pans; four 2 1/2" deep pans and one 4" deep pan, two 2 1/2" deep pans and one 6" deep pan.